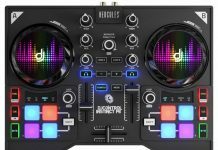 Bottomline: Small form factor, original concept and a low price: for DJs that want something different and want to explore more creative options like playing around with samples & loops, the Hercules P32 DJ is a good place to start. 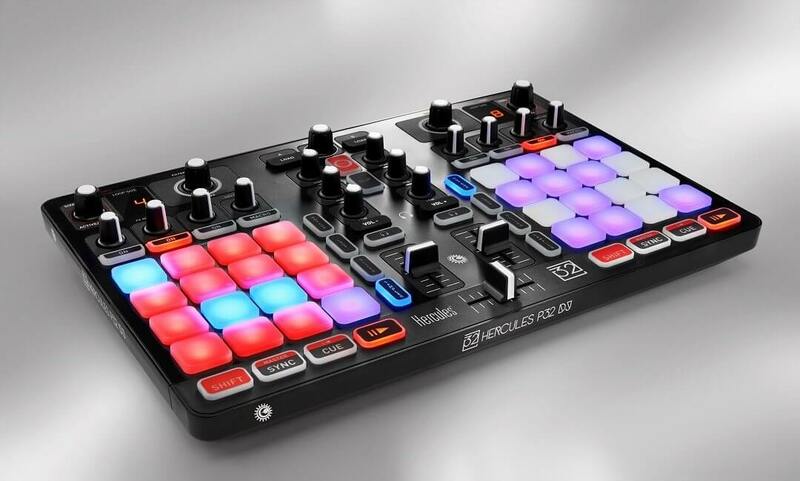 The P32 DJ is the first controller from Hercules that abandons the traditional DJ controller form factor of two jog wheels and a mixer. 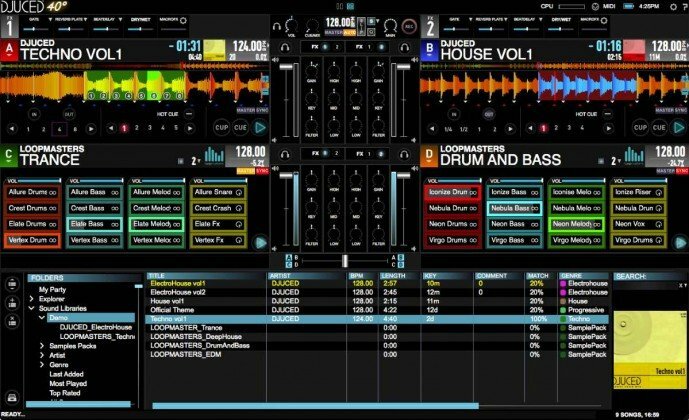 Together with the new version of Djuced 40° the unit is designed to work with beat gridded tracks and samples. The build quality is pretty good and although the encasing is all plastic the buttons and knobs have a solid rubber feel to them. I plugged the unit into my Mac, downloaded Djuced 40° and in a matter of minutes I was firing samples, creating loops & slices and having a LOT of fun overall. The main feature of this controller is, of course, the 4×4 pads on each deck. They have a very nice response to them and are well suited to trigger loops, hot cues, and samples. The pads can be set 4 different modes. Hotcue mode: allows you to set 16 cues per deck, more than anyone will ever need I would guess. Loop mode: here the grid is divided into two sections: the upper 2 rows let you activate loops from 1/16 beat to 8 beats that only stay active while you keep the pad pressed and stop when you release, so comparable to a loop roll function in many Serato DJ controller implementations. 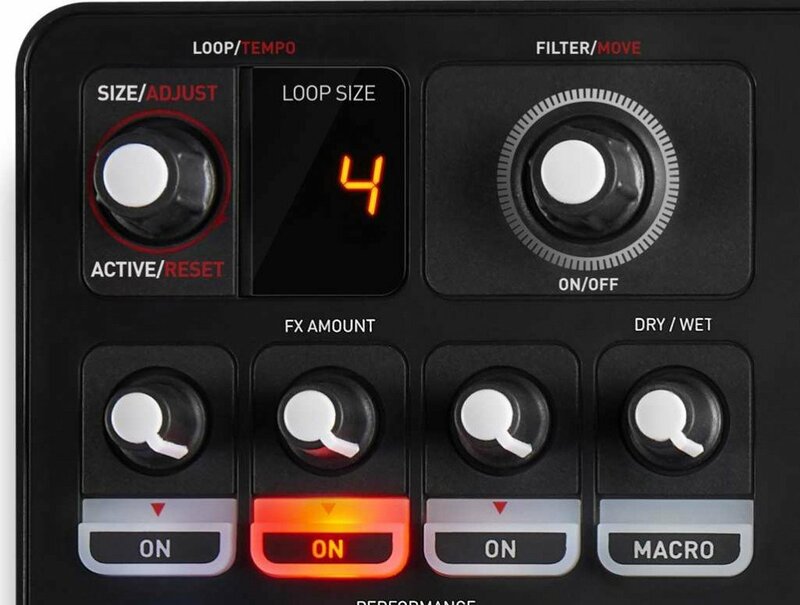 The lower 2 rows allow you to trigger loops from the same size but they stay active until you press the pad a second time, so the classic loop in, loop out mode. Slicer mode: in this mode, you can slice up a loop into parts and activate these parts using the pads. You can create slices from 1 beat up to 32 beats and have a lot of fun playing around with the parts and basically rearrange the music on the fly. 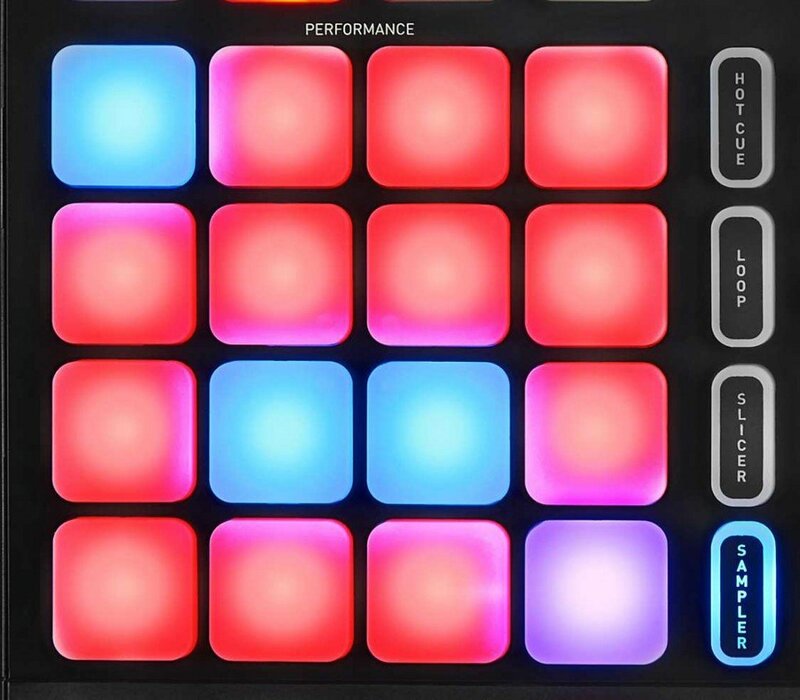 Sampler mode: in sampler mode, the pads obviously serve to trigger samples. 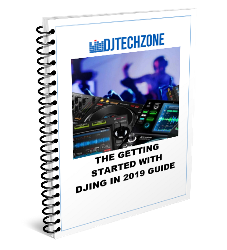 If you have a sample loaded, simply hitting the pad will launch the sample (they can be configured to play as one-shot or continuous loop in Djuced 40°) and pressing shift + hitting the pad a second time will stop the sample. The samples will launch in quantized mode and you can fine tune the quantize to be more precise or less. The transport section consists of a big shift button, a sync, cue and play button. 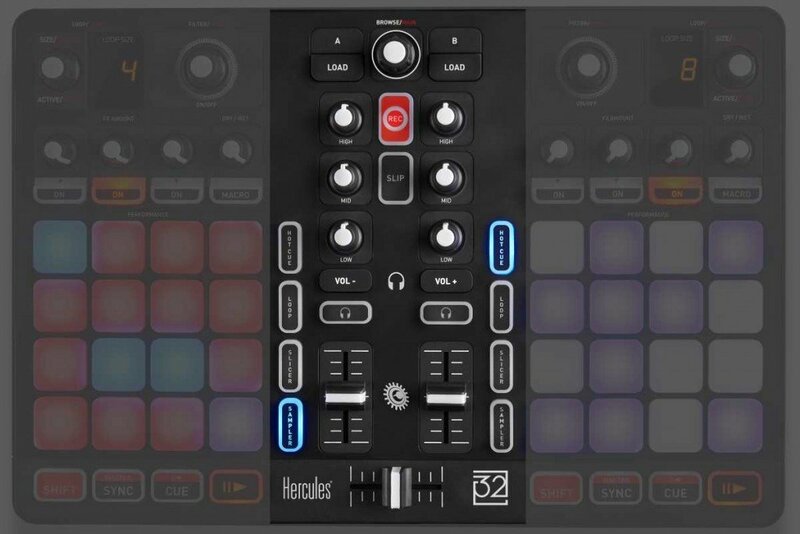 The Shift button is crucial on the P32 DJ since many important functions like tempo change and track adjust are only available when using the shift button with another function. The P32 DJ has two channels of control. Besides the obvious functions like crossfader and line faders and headphone cue buttons, you will also find headphone volume control buttons and a 3 band EQ. Centrally placed you will also find a big red record button and a very handy slip button that will keep the track playing underneath loop rolls and other effects. Finally, the track navigation section will allow you to navigate your library and load tracks to the decks. The effects section allows control for 3 effects at the time and has a macro function that activates 3 effects in 1 go. 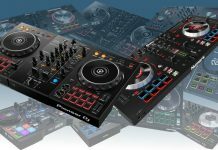 The P32 DJ has a Traktor S4 style loop size rotary encoder that doubles as a tempo adjust knob when pressing the shift button. The filter knob is located next to the loop encoder and doubles as a track navigation knob. Much better would have been here to integrate a touch strip for easier track navigation and adjustments might be something for the MK2 version. Nevertheless, the knob does its job well. No surprises on the back of the P32 DJ. RCA outs and a USB input, nothing else. The controller is USB powered so be sure to power your PC or Mac when playing for longer periods. 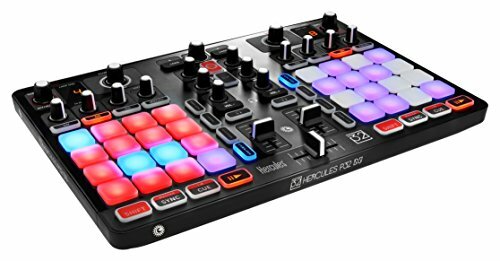 The P32 DJ is a nice outing from Hercules and kudos to them to have the guts to bring out a controller that has no jog wheels. 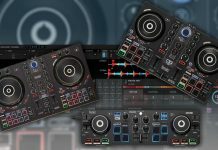 In the market segment they operate, taking risks is not a given and especially not when you are introducing a workflow that is more the terrain of advanced DJs that use far more complex gear and software such as the S8 from Native Instruments and Traktor Pro or Ableton with the Novation Launchpad. I like the P32 DJ and had much fun with it. 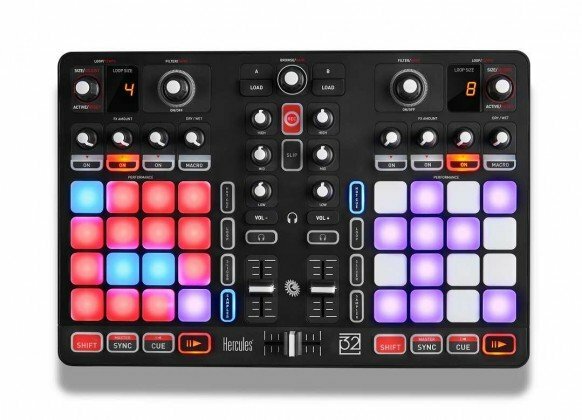 I’m pretty certain it will appeal to creative DJs that are on a budget and want to try a different approach to DJing without having to spend the cash on, for example, a Native Instruments controller. The thing I miss the most is a touch strip. If you want to fine-tune the position of a track, using the filter rotary encoder in combination with shift is just not precise enough to set the marker just where you want it. So Hercules, if you are thinking of an MK2, keep that in mind :-). 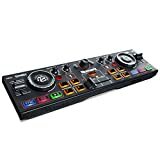 Check out below my video review for the P32 DJ! 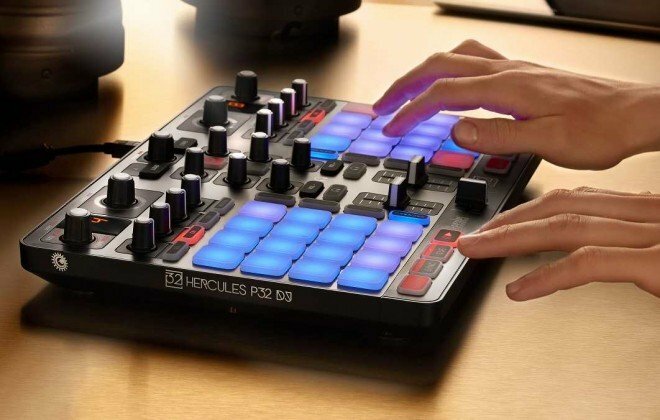 Small form factor, original concept and a low price: for DJs that want something different and want to explore more creative options like playing around with samples & loops, the P32 DJ is a good place to start.